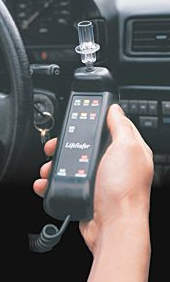 Should We Use Interlock Instead Of License Suspensions For Ohio DUI/OVI Sentences? An Ohio DUI / OVI sentence has several parts. There is mandatory jail time (or a driver intervention program for a first offense), a mandatory fine, and a mandatory license suspension. For a first offense, the license suspension is a minimum of six months and a maximum of three years, and the judge has discretion to grant or deny limited driving privileges. There are also optional sanctions for a first offense, and one of those sanctions is the use of an ignition interlock device. Proposed legislation in New Jersey would replace mandatory license suspensions with mandatory use of an ignition interlock. Should Ohio consider this change? An ignition interlock device (IID) is a mechanism installed in a vehicle that measures the alcohol present on someone’s breath. After the IID is installed, the driver will have to blow into the IID before he or she is able to start the engine. The vehicle will not start if the alcohol concentration on that person’s breath exceeds a predetermined limit. In New Jersey, there is opposition to the proposed move from license suspensions to ignition interlock devices. The main argument against the change is that removing the license suspension would remove ‘the strongest deterrence to drunken driving’. The deterrent effect of a license suspension is questionable, as thousands of people drive drunk in Ohio every year despite the existing license suspension and despite frequent anti-DUI PR campaigns. In addition, the reality is that losing one’s license does not prevent someone from getting into a car and driving again. It is illegal to drive on a suspended license, but that doesn’t actually stop a person from driving under suspension. The problem with mandatory license suspensions and discretionary driving privileges is that this arrangement often causes people to lose employment. I understand the principle that ‘you reap what you sew’, but loss of employment is a really harsh consequence not faced by defendants with similarly categorized offenses. One person could intentionally assault someone and not face a job-threatening license suspension while another person drives with an alcohol level slightly over the limit (maybe not even impairing their ability to drive), and does face a mandatory suspension, possibly without any driving privileges. Replacing mandatory license suspensions with mandatory ignition interlock would make for punishments that are more consistent for offense similarly categorized. The use of ignition interlock has its drawbacks. One downside is the cost. It may cost between $100 to $200 per month, with additional charges for installation or removal. Installation and removal must be done by one of Ohio’s certified ignition interlock providers, and the cost ranges from $200 to $300. Another problem is the device’s questionable reliability in measuring breath alcohol concentration. In addition, there is the embarrassment of having the device in your car. Finally, if the device requires a ‘rolling retest’, it can actually be dangerous. The California Department of Motor Vehicles found that there was a 130% higher risk of a subsequent crash for DUI offenders forced to use an IID. From the perspective of a defendant, I think the positive features of IIDs outweigh the negative aspects. So, should Ohio move from mandatory license suspensions to mandatory ignition interlock devices? One possibility would be a hybrid approach, at least for first offenses. We could maintain the mandatory license suspension, add the mandatory ignition interlock, but also make driving privileges automatic and broad, conditioned on the use of the IID. For a first offender who makes an isolated mistake, this approach would achieve a good balance between the need to punish/deter and the value of having the punishment fit the crime. *On April 6, 2017, Ohio began the use of ‘unlimited driving privileges’ which involve the use of ignition interlock devices.